Broken punch bowl? No worries. Just save the base! My poor punch bowl was cracked and no longer functional but I liked the heavy cut glass base. So, I ditched the bowl and salvaged the base. Here’s what it looked like without the punch bowl. Still pretty and can function alone as a bowl too. I flipped it over and it’s the perfect size for a candle! I toyed with painting it white, but I kind of like it as is. 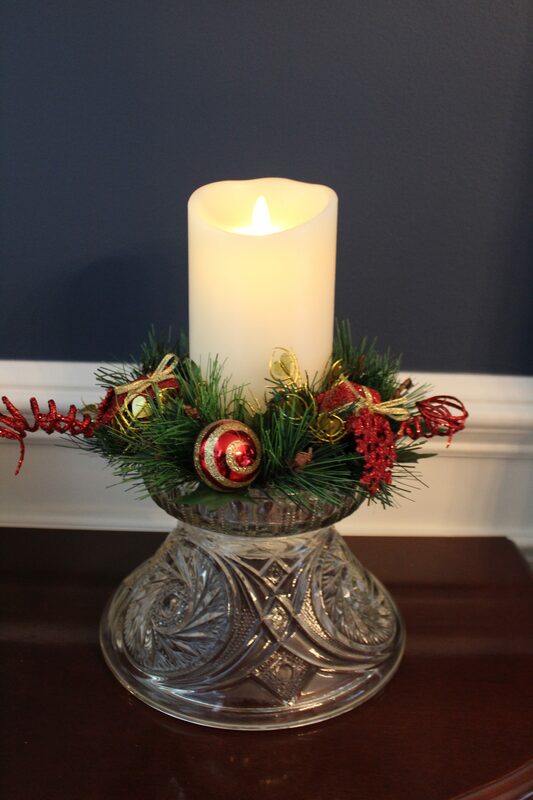 At Christmas I added a small festive wreath and Luminara candle to my new candle holder. I am really in love with Luminara candles. They are so realistic looking and the fact you can put them anywhere and use the remote control to turn them off and on is really handy. And no need to worry about open flames. I liked it paired with my glittery Christmas trees in the dining room. Isn’t it fun to reimagine something’s purpose?